The best steak that I ever had was over four years ago. My first bite was rewarded with an intense, mouth-coating umami flavour. Then, with each drawn-out chew, the flavour would subtly change like a fine wine. I felt as if I could sense what the animal was fed; think nutty, popcorn or hay-like flavours followed by a rich sweetness that lingered, waiting for the next inevitable bite. This was my first experience with a truly good, boutique steakhouse. Though never one to turn down a steak, until this point I had often looked down upon steakhouses. After all, with a good butcher and some skill with a cast iron pan, I believed I could turn out an equally - if not better - quality steak at a fraction of the price at home. Nine times out of ten, I still think I’m right. But what set this particular steakhouse apart (Toronto’s celebrated Jacob’s Steakhouse) was the restaurant’s custom dry-age program. My particular steak, a bone-in striploin from Van Groningen Farms, was aged for 120 days. When it comes to meat, it turns out, fresh is not always better. 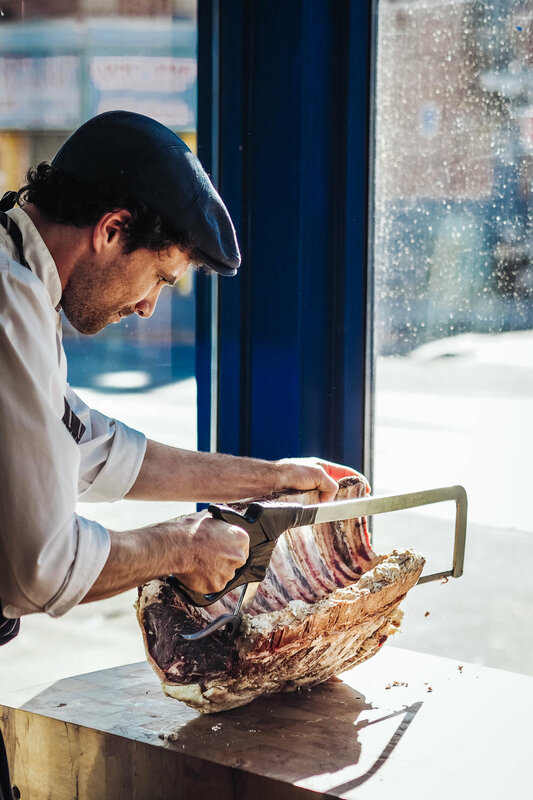 And, though even the most avid foodie will be hard-pressed to find a 120-day aged steak without custom ordering, there are select butchers in Toronto that give a similar treatment to their prime cuts. Leslieville boutique butcher, Butchers of Distinction, is one of them. This is exactly where we’re heading today to learn about how the dry aging process works. It bears mentioning that Butchers of Distinction - known simply as “Butchers” in my household - is my favourite meat shop in all of Toronto. While living in the east side, my visits to Butchers would be nearly daily. Now, despite living on the opposite side of the city, I still make a weekly trek for my protein fix. Robert Mee, head butcher, meets us at the door. Originally from Ireland, Robert’s first exposure to life behind a butcher counter started when he was 12-years old. “In Ireland, you would never find beef that wasn’t aged for at least two weeks,” explains Robert as he leads us into the walk-in cooler at the back of the shop. 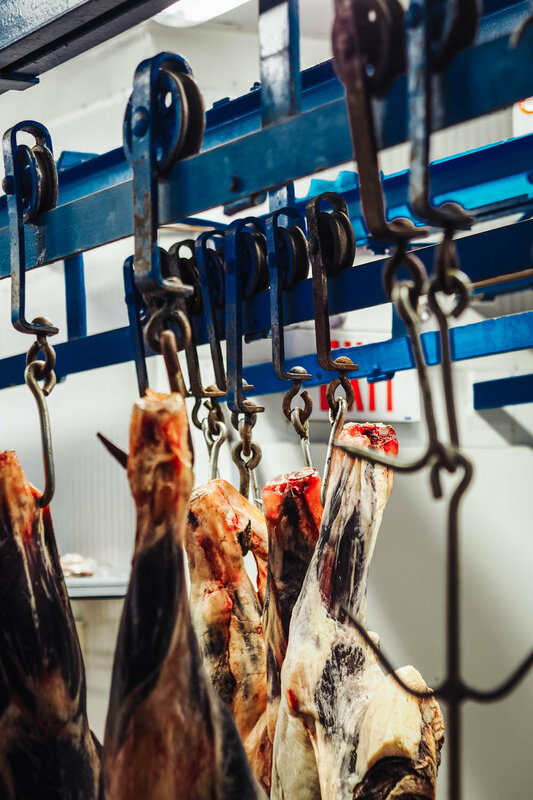 The carcasses of different animals hang neatly on hooks in the middle of the walk-in. Butchers of Distinction practices whole-animal butchery: a distinction from most supermarkets where meat arrives pre-packaged or in smaller primals from one of the large packing conglomerates. The dry aging process is relatively simple. First, Robert selects primals - large cuts of meat initially separated from the carcass - with the best dry aging potential. “Most of the cuts we use have a good amount of marbling,” says Robert. “If it’s too lean it doesn’t age well.” At Butchers of Distinction, T-bones are a particular favourite to age. These cuts are then methodically tagged and placed on the shelves I’m peering at, occasionally rotated to allow for an even process. About a month later it’s time to trim the desiccated layers of meat and fat from the full primal before cutting into recognizable steaks for serving. Robert demonstrates this by preparing some ribeye steaks for the case. It starts with a large rib roast about as long as my arm. The primal is gnarled, with a deep red, clearly dried colour. It’s also rock hard; there’s very little yield as I try to press into its fat cap. Robert begins by cutting back some of the bone with a saw (a ribeye comes from a cut that sits along the spinal column). Then, with deft cuts from a knife, he trims back the outer layers of meat to yield fresh, red muscle underneath. On the surface, it’s like Robert is making large beef raisins. Dig a little deeper, though, and you’ll find that there’s far more than meets the eye. First comes the drying component to the aging process. Robert informs me that after 30 days, their steaks lose between 10-15% of their weight in water and trimmings. This is believed by many to concentrate the flavours in the meat, allowing for a more beefy flavour. Kenji Lopez-Alt at Serious Eats begs to differ, cleverly asking why there is no size difference between similar cuts of steak with and without the dry aging treatment. The most likely culprit of dry aging’s transmutation is the enzymatic process the meat undergoes at a cellular level. The meat certainly isn’t rotting, though some light mold on the surface is normal during the process. Proteins, fats, and sugars in the meat slowly start to break down into different amino acids. Chief among these acids is glutamate, the same flavour compound responsible for the rich, meaty flavour of mushrooms. The end result is a remarkably flavourful steak with a softer, more tender mouthfeel: a better steak. That, and a much, much more costly steak: in time, specialized labour, and inventory shrink. It’s the most prominent reasons why dry aged meat is a small luxury found almost exclusively at speciality butchers. In contrast, most meat found at your local supermarket is given a wet aging treatment. Wet aging works in the exact opposite way that dry aging does; meat is placed in vacuum-sealed bags (think the whole bagged tenderloins available at Costco), where it tenderizes while in-transit to the shelf. All of this is accomplished with no loss in water or trimming weight - more costs saved by the grocery store. But, while the meat may be more tender than fresh from the carcass, no other flavours have had time to develop. The result isn’t necessarily bad; wet aged beef is the flavour that most Canadians are used to. Just, it could be so much better. Like Scotch whisky, older does not necessarily mean better. My 120-day aged steak was an aficionado's steak - funky, complex, and ludicrously expensive. For many, the sometimes near-blue cheese funk of a very old aged steak can be offputting. At Butchers of Distinction, Robert chooses to age their meat for 30 to 35 days. It's the perfect blend of rich, enhanced beef flavour without going into exploratory taste sensations. Similarly, not all meats were meant to be dry aged. 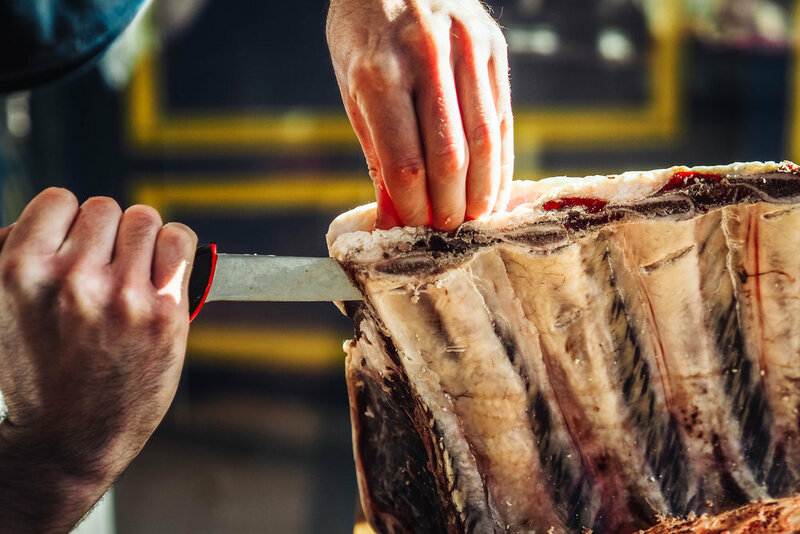 Beef is the most popular candidate for dry aging, and for good reason. First, it contains enough of the necessary enzymes needed to break down into amino acids. Second, beef cuts are large enough, and with enough fat, to be able to withstand the aging and trimming process. Try this with a Cornish game hen, for example, and you’d likely end up with a thimble of usable meat. For Robert, lamb doesn’t age particularly well. Though he does give some of the pork in Butchers of Distinction’s case a couple days of age. He’s also seen chicken work. I, personally, will vouch for dry aged duck. Butchers of Distinction enjoys strong, traceable ties to its suppliers (in fact, one of the owners owns a farm). The result is a large blackboard at the front prominently displaying the breed, origin, and particular diet of each cut found in the case. It also makes for a better product to age. As we wrap up our conversation I’m staring longingly at the steaks. Perhaps a pound of ribeye would make for a good late lunch. It’s tempting. But I know that I’ll be back next week. And, as for The 3 Spoons, it won’t be the last time we visit. Words by Nicholas Wong. Photos by Abhishek Dekate. Special thanks to Robert and Butchers of Distinction for taking the time to teach us about dry aging. If you’re in the area (and even if you’re not), drop by to pick something up for your next dinner. And tell them that Nick says ‘Hi!’.